A newly installed toilet should clear up any problems with sewer smells, theoretically, at least. However, if the toilet isn't installed correctly, or installed with failing parts, it can leak, causing both water and sewer gas to escape. If you find that your newly installed toilet causes a sewer smell in the bathroom, try checking out a few common problems in order to solve the situation. Toilets connect to the sewer system through a plumbing fixture called a flange or closet flange in the bathroom floor. The flange is mounted on the end of the sewer inlet pipe buried in the foundation of the house. Two slots on either side of the flange hold flange bolts. The base of the toilet fits over these flange bolts and is secured by flange nuts. A wax ring sits between the flange and the outlet at the bottom of the bowl and helps keep the connection water and airtight. 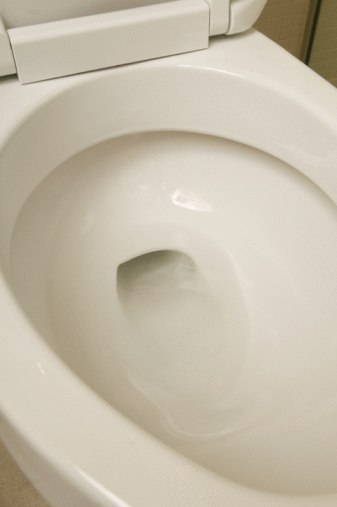 Sewer gases can escape through the base of the toilet if it isn't secured properly. Fix this by tightening the bolts at the base of the toilet. There may be bolts covering the tops of the bolts. Pry these off with a screwdriver, if present. Take care when tightening the bolts, as over tightening can cause the porcelain to crack. The best method of tightening is to turn the nuts by hand as far as they can go, then another turn or two with a wrench. If the wax ring wasn't installed, this also leads to a gas leak, even if the toilet looks like it has been properly secured. Wax rings are very inexpensive to purchase at a hardware or plumbing store. To install a ring, remove the toilet by draining and removing the tank, then loosening the flange nuts on the bowl. Press the ring into place around the inlet. Replace the toilet and tank and secure the flange bolts at the base. An improperly installed wax ring or a bad ring is almost as bad as no ring at all. Rings can be tricky to install, especially for new plumbers. If the plumber who installed the toilet handed the job off to his apprentice, there's no telling where the wax ring may have wound up. In cases like these, the best solution is to remove the toilet, scrape up the old wax ring with a putty knife, install a new one, then replace and secure the toilet. Applying a bead of silicone caulk around the base of the toilet keeps any sewer gas that happens to escape past the wax ring trapped underneath the base of the toilet, preventing you from having a sewer smell in the house. When applying the caulk, use waterproof caulk that holds up in a moist environment. How Do I Know If a Toilet Wax Ring Is Bad?